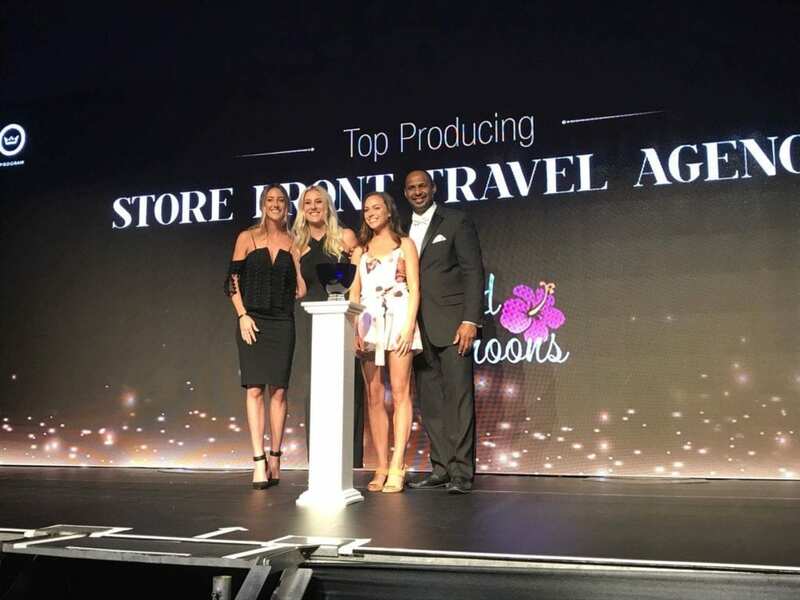 We are proud to announce that Enchanted Honeymoons Travel was recognized last week at the Palace PRO Awards Gala as Top Producing Store-Front Travel Agency overall. We were also recognized as a Platinum Agency with Palace Resorts, which is the highest category for travel agencies. A huge THANK YOU to our dedicated travel agents for their hard work and commitment. We would also like to thank our clients who have helped make this possible! 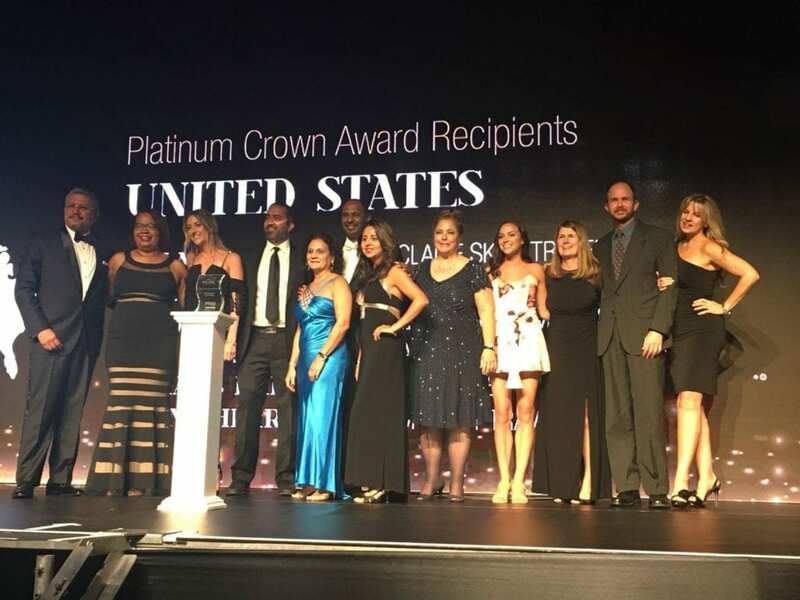 The Palace PRO Awards Gala took place during the Palace Experience Global Conference at the new Moon Palace Jamaica Grande resort in Ocho Rios. Two of us (McKayla and Kelly) spent four nights at this beautiful all-inclusive, family-friendly resort. During this time they were able to learn more about Palace Resorts, including details about the new Le Blanc Resort & Spa opening in Cabo next month! We especially enjoyed the workshops on destination weddings and social media. We were invited on a catamaran excursion along with other top-producing agencies that picked us up right from the pier on-property. The catamaran took us to Dunn’s River Falls where we formed a human chain with our group members to climb the cascading waterfalls which flow directly into the ocean! Our Business Development Manager for Palace Resorts, Ginny Singer, along with Frank Corzo, the Vice President of U.S. Sales, were on board the catamaran and our agents were able to make great connections as well as get an inside scoop on all things Palace Resorts! We love Palace resorts because of their excellent service. This new property in Ocho Rios was no exception! Combine this standard of service with the extremely friendly and outgoing people of Jamaica, and expect to feel like a king or queen during your stay at Moon Palace Jamaica Grande. The layout of the hotel is convenient and the aesthetic is gorgeous. Although it is on the large side, it feels cozy and accessible. Our room was in the farthest tower (Tower 1), but was still convenient to get to. We liked that we could easily run back to my room from the beach or pool. Our agents enjoyed the wide variety of food and the availability of it. With several restaurants and bars, there is something for every taste bud! Plus, the food court right next to the stunningly decorated lobby is a great place to grab a snack. Come here for a beach break to grab a panini, slice of pizza, or sushi roll. Check out the 24-hour coffee bar where you can order gelato, espresso drinks, and paninis. The steakhouse, set on the pier right above the water, was my favorite restaurant. Don’t miss the truffle parmesan mashed potatoes at this spot. Our rooms were spacious and beautiful! Our junior suites were in Tower 1 (of three), set just in front a quiet stretch of beach. This tower is quiet and peaceful, which would be great for honeymooners. McKayla stayed in a walk-out on the ground floor and Kelly stayed a couple floors above with a huge balcony. Our breakfast view was incredible (check it out below)! With so many resorts to choose from, it’s easy to get overwhelmed. Get in touch with an Enchanted Honeymoons travel agent today to find the perfect all-inclusive resort for you! You can also reach us by calling 402-281-3022.